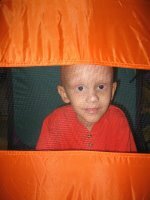 Gavin will be 4 years old November 12th, and he is being treated for a brain tumor that spread to his spine. His parents just found out that their other little boy, Garrett, has something neurological wrong with him as well. Please be on your knees in prayer for this family. You can read their story here. I accidentally stumbled upon this website and was astounded. I have 2 boys — Garrett (born Nov. 14/91) and Gavin (born June 10/95). Fantastic names & fantastic boys as I am sure your boys are. My thoughts and prayers are with you and will continue to be with you each and every day. Please let me know how the boys are doing. Previous Previous post: I’m a Fruit!